— The essence of the Vedas' teachings, an 18,000-verse history of Krishna's incarnations, pastimes and devotees. — Krishna's instructions on the purpose of life and how to achieve ultimate success in this world and the next. — The life and teachings of Chaitanya Mahaprabhu, Krishna Himself appearing in the guise of His own devotee. — A summary study of Rupa Goswami's Bhakti-rasamrita-sindhu, the essential guidebook on the science of bhakti-yoga, practical devotional service to Krishna. — Srila Prabhupada's commentary on the tenth canto of Srimad-Bhagavatam, which describes the pastimes Krishna Himself performed when He visited the earth. —Read Srila Prabhupada's published books online. His books, now published by the Bhaktivedanta Book Trust in 81 languages (as of June 2013), now comprise over 80 volumes, with over a billion copies sold. Srila Prabhupada is the founder-acharya (spiritual preceptor) of the International Society for Krishna Consciousness. In addition to writing many books to establish the philosophy and practices of the Krishna consciousness movement, he worked tirelessly to build a unified organization meant for spreading the teachings of Krishna consciousness. —Search for a temple, community, restaurant, farm, or local gathering near you. —Milestones in Srila Prabhupada's and his disciples' efforts to create, spread, and maintain a worldwide society of Krishna devotees. —How Srila Prabhupada brought Krishna consciousness out of India and established a global spiritual movement. —A document Srila Prabhupada composed in 1966 which still serves as the mission statement of the movement he started. —The Srila Prabhupada Disciple Database is now online and searchable. You can search for Srila Prabhupada's disciples using the Search option or alphabetically by name. 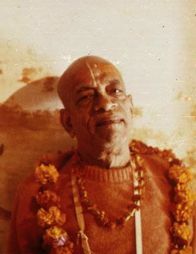 - A collection of over nineteen thousand photographs taken of Srila Prabhupada between 1966 and 1977. Please help us to categorize these photo albums. If you see a photo you can identify by place, persons, or circumstances, kindly Contact Us. —A free download explaining the historic and spiritual significance of the title "Founder-Acharya" and why Srila Prabhupada preferred to be known as such. — The life of the great spiritual teacher who brought the teachings of Krishna to the world. Also available in our Store. —The official repository for the documents, manuscripts, correspondence, audio recordings, photographs, films, and other memorabilia of Srila Prabhupada. — Srila Prabhupada managed a worldwide society through these practical, individual instructions to his disciples. Each day, the homepage shows a list of letters Srila Prabhupada wrote on that date during his lifetime. —Search for Srila Prabhupada's disciples alphabetically by name or by using the Search option. — Contains most of his published works. This site now includes biographies written about Srila Prabhupada.